Buy Triangle of Health Products here also – Kyani Sunrise, Kyani Sunset, and Kyani Nitro FX/Xtreme! The Kyani Health Triangle gives you a HEALTHY feeling like no other - by providing a powerful, easy to use wellness system that provides unmatched nutrition for optimal health. The Kyani Health Triangle features the supreme natural products of Kyani Sunrise, Kyani Sunset, Kyani NitroFX and Kyani NitroXtreme. Each product works harmoniously to provide unmatched nutrition for your most optimal health. Our skin is constantly exposed to environmental factors that cause damage, and as we age our skin’s ability to repair itself diminishes. Kyani has leveraged its expertise in ALL NATURAL botanicals to harness extracts from a Swiss apple that defied the normal spoiling process to stay fresh. Utilizing these extracts and other NATURAL ingredients including Blueberry, Noni, and Tocotrienols, Kyani has developed Fleuresse—a premium line of skin care products that hydrates and nourishes your skin for a brighter, more youthful appearance. 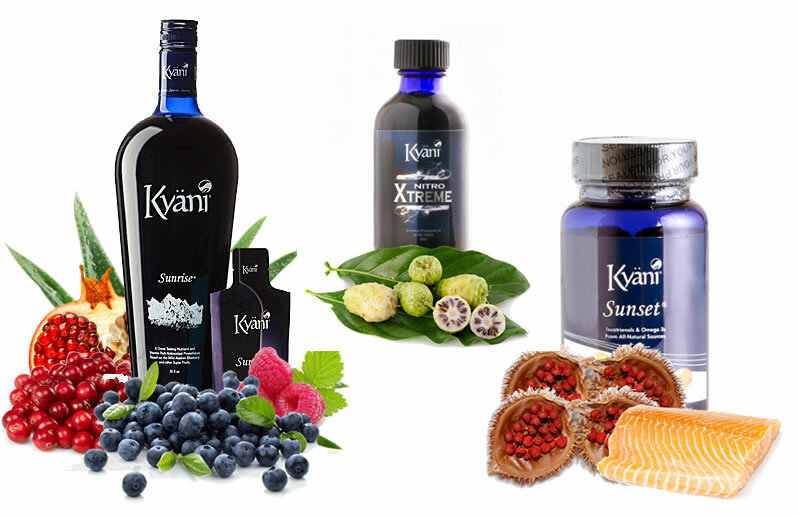 We sell Kyani Products as official Independent Distributors. All Shop buttons on this page will be redirected to the official Kyani Shops page online to place your order securely. Please note that aside from Kyani Skin Care Products, you can also browse our Kyani Triangle of Health page to check out Kyani's original products of Kyani Sunrise, Kyani Sunset, and Kyani Nitro. We hope that you enjoy browsing our site and also be sure to check Kyani's latest updates on our News page. If there's Any problems with your order, please Contact Us. Thank you for your business! We are pleased to announce that Kyani Skin Care Products is NOW available! Buy Fleuresse and other Kyani Products Online right here! Are you ready to Be Timeless? Introducing Fleuresse Kyani—a new line of skin care products from Kyäni that combats the visible signs of aging in your skin by connecting the latest advances in science with the very best ingredients nature has to offer. To create Fleuresse, Kyäni incorporates the exceptional ingredients we've used for many years in the Triangle of Health: including Blueberry, Noni, and Tocotrienol Vitamin E, with plant stem cell extracts from a rare variety of Swiss apple. With this combination of ALL NATURAL & HEALTHY ingredients, Fleuresse Kyani acts to hydrate and cultivate your skin - revealing a dazzling, more youthful looking appearance. Order Kyani Skin Care right here on our website. Any questions, please ask! Kyani Sunrise combines polyphenol-rich Wild Alaskan Blueberries with other natural extracts for a delicious, vitamin-packed powerhouse to help you get your day started right. Kyani Sunset is an excellent source of essential omega-3 fatty acids from fish including Wild Alaskan Salmon and other naturally sourced ingredients to support healthy systems throughout the body. Kyani Nitro utilizes the power of Noni to promote production of Nitric Oxide, a key signalling molecule in many biological processes that supports healthy sirculation. Order Kyani Triangle of Health right here on our website. Any questions, please ask! This is an official Kyani Independent Distributor page, so you will be redirected to Kyani Shops to place your order securely. Any problems with your order, please contact us. Thank you!